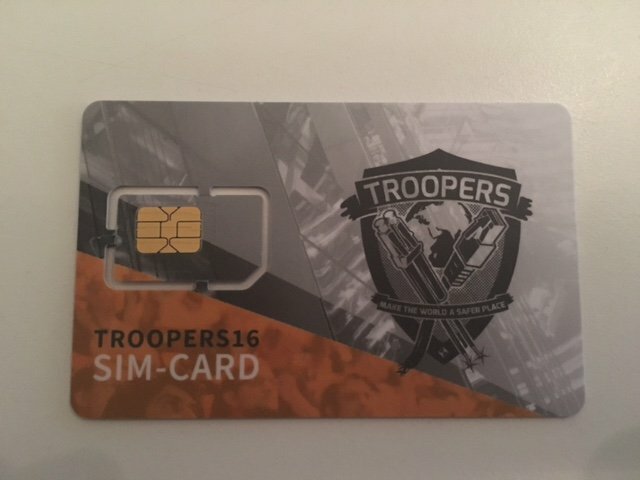 In contrast to last year, you will need a Troopers SIM card to attend the network with your cellphone. The SIM cards will be handed out at the registration desk; if you have questions you always can contact me or Kevin Redon (thanks again for assisting us). There will be a phonebook available at http://gsm.troopers.de. The URL will be available in the conference network only. Here you can look up the phone number of other attendees. Once you attach to the network you will be registered to the phonebook automatically with a “standard name”. If you want to change your displayed name, you can send an SMS with your_name to the number “1000”. You will be able to submit tokens of Troopers16 challenges via SMS. To do this, you have to send a SMS with your_token to the number “1111”. could you bring your SIM-card staplers (or how ever they called) to the registration desk? Being able to trim to micro-/nano-SIM size would be very useful. there will be some cutters/staplers (whatever) at the registration desk. could I use a dual-sim-phone?